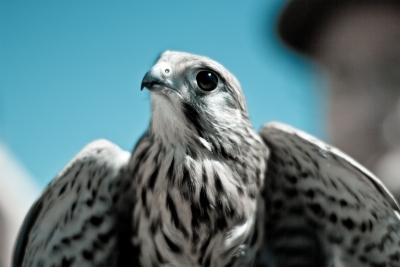 How do we create leaders of the future for Saudi Vision 2030? I came across a thought-provoking blog on the future of Saudi leadership by Professor William Scott-Jackson, chairman of Oxford Consulting Group last week. In it he argues that Saudi will need 1.9m leaders to achieve Saudi Vision 2030. 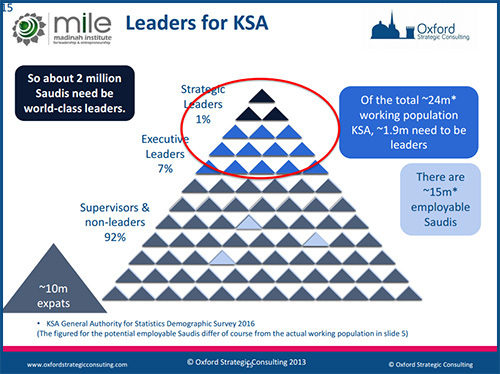 With a population of around 15m employable Saudis, this will be a challenge in terms of pure numbers, let alone skills. I have spent the last few months interviewing a number of Saudi chief executives and chairmen to gather views on what makes an outstanding Saudi chief executive – in particular the skills that will be needed to take the Kingdom through a period of great change over the next 15 years and how you develop these skills. This is very relevant to how the Kingdom develops these 1.9m leaders for the future. We will be publishing this report early in 2017, but here I want to share insights from our conversations and add to – and challenge – some of Professor Scott-Jackson’s comments. And this view was shared by all the leaders I interviewed. However, while I agree leadership skills are critical, I think it is easy to overlook the importance of being able to ‘manage’ and get things done. I would place as much importance on this as ‘leadership’. It is easy to under-estimate the skills needed for different cultures. I think what will differentiate Saudi businesses will be those with chief executives who have an ability to get things done. Of course, leadership plays its part in that but in doing that, we should not overlook management ability when recruiting and developing future leaders. In a study by Caliper into the most important and difficult aspects of leadership, 300 presidents and CEOs shared their thoughts on aspects of leadership. They were asked to rank various tasks: creating the right vision, getting people to embrace the vision, maintaining momentum (motivating, influencing and persuading), managing change (strategic planning, problem solving), surrounding yourself with the right people, developing staff (coaching, managing performance, transforming teams), and delegating. Nowhere in here does it refer to ‘gettting things done’. You could argue that if you surround yourself with the right people and are good at problem solving and delegating , then this will ensure that things are done. But I think there is another layer of skill needed in here that is specific to getting the best from the Saudi culture. Saudi leaders need to understand how their business works, particularly the profit drivers and have a particular skill in helping their teams to unblock problems. Aspects of the Kingdom’s culture can make this challenging – especially family dynamics and respect for elders. There is a lot in the Professor’s article that I like and agree with. He asks how can Saudi build leadership skills fast – and looks at some specific advantages of the Kingdom. This was something we were keen to do in our interviews – ask leaders to share what is good about Saudi leadership that should be retained as the Kingdom goes through change. There is often a tendency to think the West has all the answers and put the wrong values and priorities on to another culture. 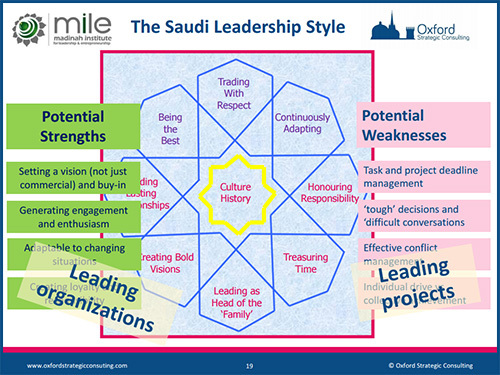 In his analysis of Saudi Leadership style (see the table below), he highlights potential weaknesses as ‘task and project deadline management’ and ‘tough decisions and difficult conversations’. The first, project deadline management, comes back to the point about making things happen – and is one of the most critical skills to ensure success in the Kingdom. The second point – taking tough decisions and having difficult conversations – was discussed by nearly all the leaders I interviewed. In a period of change, a good leader may have to ask loyal and hard-working people to leave, because they do not have the right skills for the job to be done. This is not easy for any leader but it is a question of ensuring the right people are doing the right jobs and that the organisation is ‘fit for purpose’. How else do leaders need to be developed? The Professor says everyone needs a qualification such as from the Chartered Management Institute and to start leading young. While our interviewees rated qualifications, several were keen to bring ideas and different approaches to the country such as from China, Korea and Malaysia. One leader commented on the Chinese being great risk-takers and focusing on volume and mass markets – where the West tends to lean more to niche markets. They felt a mix of thinking will best benefit the Kingdom. Many of our leaders also talked about learning the basics in their family businesses from a young age and working their way up. They felt it stood them in great stead – but they talked more about doing and learning than leading when they were young. Developing Saudi leaders of the future is a big topic and I plan to expand on many of the ideas from our leaders along with our own thoughts in future blogs. I would welcome other ideas and experiences on this important topic.